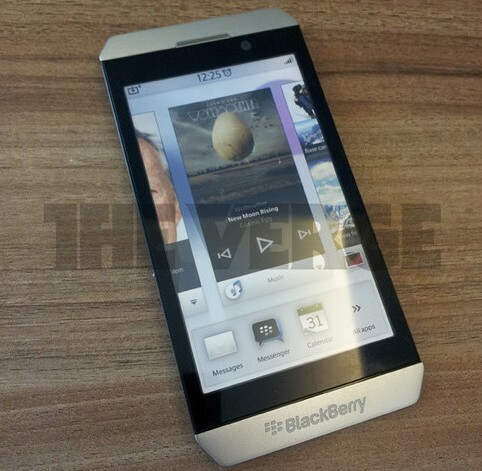 It is raining leaks regarding the upcoming BlackBerry 10 OS. Research in Motion just gave us a sneak peek into the OS but now through a series of leaked internal slides we are getting to know how the OS could be on arrival. After the leak of probable Screen Sharing features, we now have another leaked slide which shows us how the Screen Lock Layout could be and how notifications would appear on it and how we can unlock the device. As you can see in the image below, the Lock Screen is pretty simple and basic. On the top left side we have the Clock whereas there is a Camera icon which can shoot up the Camera app directly from the Lock Screen just like iOS. On the left we will have ‘Peek Icons’ which will inform the user if they have any unread texts, BBM pings, Missed calls or even Twitter Mentions which sounds sweet. The unlocking of the device is also nice. 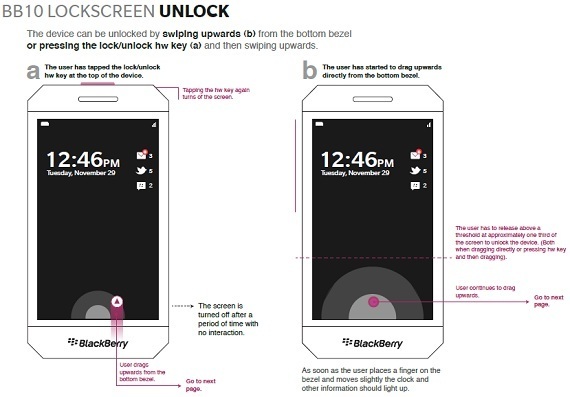 RIM is giving users two options to unlock the device. First is by pressing the Lock/Unlock HW Key which will be situated at the top of the device if we consider the a) in the image above. Another way to unlock the device is to drag the screen up. Yes! The user will have to drag the screen up from lower bezel (just like Windows Phone), to at least one-third of the device to unlock it, which is quite awesome and can be seen in the b) of the image below. Also note that the device used for illustration in the Unlocking process carries the same sharp edged design which we have seen multiple times before in reference to the BlackBerry London which is still expected to be the first BB10 device to launch. And this image just almost confirms it. Next up is a features dubbed as ‘Cinnamon Toast’ by RIM which is very interesting. When a user receives an SMS, the device will use its accelerometer and this will help in revealing information of the SMS. 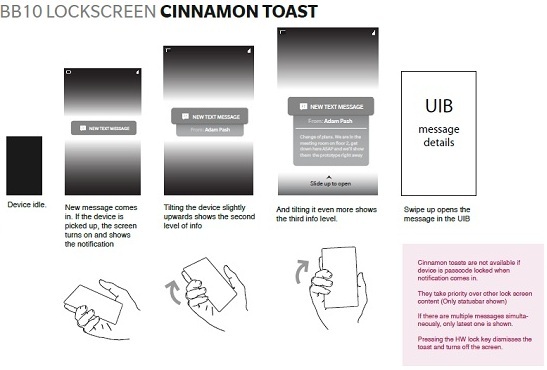 In ‘Cinnamon Toast’, tilting the device at different angles will enable user to view different amounts of information as you can see below. Awesome! Impressed by the BlackBerry 10 OS already or need more?